The Avid Pro Tools | HD Native Thunderbolt Core yields the same low latency, high channel count, and pristine audio quality as a PCIe-based HD Native card, but in a compact desktop format. If you own a modern Thunderbolt-equipped computer without PCIe slots, you can finally step up to a real Pro Tools | HD rig. This ultra-portable recording interface isn’t just small enough to fit in your laptop case, it runs on Thunderbolt bus power, so you don’t have to worry about finding a power outlet. 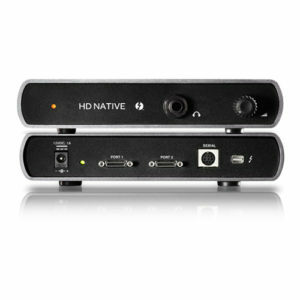 And the Avid Pro Tools | HD Native Thunderbolt Core’s audiophile-quality headphone output is perfect for mobile editing. The Avid Pro Tools | HD Native Thunderbolt Core yields the same low latency, high channel count, and pristine audio quality as a PCIe-based HD Native card, but in a compact desktop format. If you own a modern Thunderbolt-equipped computer without PCIe slots, you can finally step up to a real Pro Tools | HD rig. This ultra-portable recording interface isn’t just small enough to fit in your laptop case, it runs on Thunderbolt bus power, so you don’t have to worry about finding a power outlet. And its audiophile-quality headphone output is perfect for mobile editing. 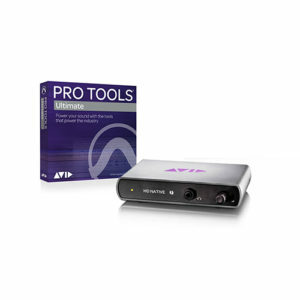 The Avid Pro Tools | HD Native Thunderbolt Core comes bundled with the latest version of Avid’s Pro Tools | Ultimate software. 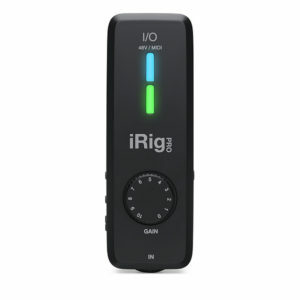 With IK Multimedia’s iRig Pro I/O, you get rack-quality mobile recording and monitoring in real time with any compatible mobile device or portable PA. IK engineered the iRig Pro I/O with 24-bit A/D and D/A converters with a 96kHz sample rate, a 1/4″ hi-Z/XLR combo input that easily handles passive and active pickup configurations, MIDI in/out, and an 1/8″ stereo headphone out with preamp and level control (making it compatible with even the most recent iOS devices). To top it off, the IK Multimedia iRig Pro I/O has switchable 48-volt phantom power for use with your favorite condenser mics!